Graduates from the October 2014 class pose in front of Rescue 74. October 25 marked the graduation of our newest Los Altos CERT (Community Emergency Response Team) members. Five weeks of classroom training mixed with hands-on exercises came to an end when the newest 13 members participated in a 4 hour drill held at the Los Altos Town Hall. The drill had the CERT members performing basic first aid, light search and rescue techniques, damage/safety assessment and fire suppression. “The classes were engaging and really informative. At the very least, it started me on a path of improving my own personal preparedness and working with my neighbors” said one CERT participant. 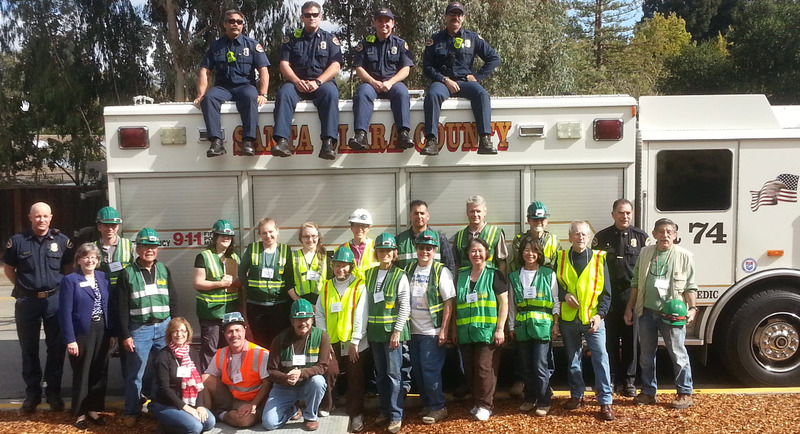 Los Altos CERT offers CERT training classes twice a year. CERT skills are very useful after a major disaster such as an earthquake that does extensive damage in your neighborhood. The next CERT class will be offered in the spring of 2015, but you don’t have to wait to sign up. Just click on the “Sign up for a CERT class” link that’s over to the right. Copyright © 2019 The Block Action Team (BAT) Program is a managed program of Los Altos Community Foundation in partnership with the City of Los Altos.